Those of us who conduct research about our family's immigration history often find information about their transatlantic voyages by searching databases such as those provided by New York's former Castle Garden and of course the Ellis Island Foundation. However, the ability to find information about later immigrations, i.e. after they closed Ellis Island, is often elusive. Most of us assume that during the years the Ellis Island Immigration Center was opened, most every immigrant passed through there to become an immigrant. However, when Ellis Island stopped becoming the center where immigrants entered the U.S. in 1924, where did they enter New York? Generally, they didn't enter through Ellis Island, but disembarked at a pier somewhere in New York, most likely in Manhattan or Brooklyn, or even in New Jersey, e.g. at a Hoboken Pier (across the Hudson River from Manhattan), or at one in Jersey City or Bayonne. So as researchers who might want information on such immigrations, e.g. during the late 1930s or 1940s, we need to know what resources are available to us. One such resource is the "Shipping News" that was generally published in local newspapers. Some newspapers only list the ships that are arriving that day or the next, as well as those departing. However, the Brooklyn Daily Eagle often published the "shipping news" within their Classified section. An important question to ask is what information does the table with the "shipping news" provide? 2. The name of the shipping line. 3. The port from which the arriving vessel sailed. 4. The month and day when the vessel departed the port. 5. The location where the vessel will arrive, most often the number of the port and the street where the pier is located. 6. The hour the vessel is scheduled to arrive. For departing vessels, similar information is available (except in reverse). So one may gain more information by using this resource. Not only will it confirm (or deny) what information we might have been given previously, but it will tell us where particular immigrants disembarked and when--not only the day but the time too! The resource for finding the copy of the Brooklyn Daily Eagle that contains the information we want can be found at www.fultonhistory.com/Fulton.html , a wonderful resource not only for the topic at hand, but also to find information from old newspapers that have been published in New York State. 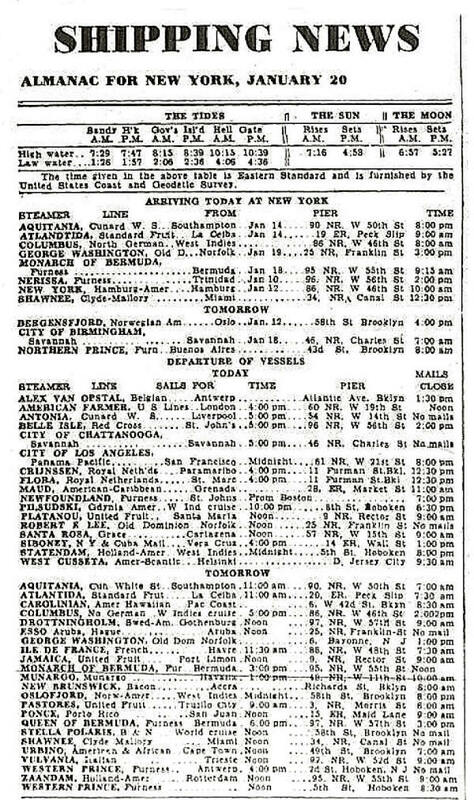 In the search field, to locate the newspaper page you seek, you may enter "shipping news" "January" "1939" if you are interested in a vessel that either arrived or departed from a pier in the New York metro area sometime in January 1939. Be sure to place quotation marks around these words and select the "all of the words" option from the drop down box. You might not find the information you're looking for, but it's worth a shot! --photo courtesy of the Brooklyn Daily Eagle, 20 January 1939. From "Old Fulton New York Postcards."